I just came back from Hawaii – and want to introduce you to my new friend, Merlinda, or “Merlin” as she likes to be called. She is part of the true American dream. She was born in the Phillipines but her parents went to Hawaii, the big island, for her dad to work in the sugarcane fields as a heavy machine operator when she was little. We spent some time at the Hawaii Plantation Museum during this trip and learned about how life was back then. Where the laborers came from, what they wore, how they lived, and how the sugar was processed. Then the industry moved to getting sugar from beets and the sugar companies eventually left Hawaii. But the beets were genetically modified, and things are moving to non-GMO. So, what’s old is new again. Companies are going back to sugarcane. But, back to Merlin! I love to visit farmers markets when I travel. It’s a great way to see what an area is really like and to meet local people. 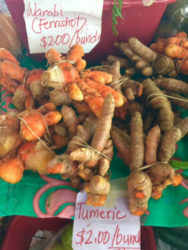 We were at the Hilo Farmers Market last week and met Merlin at her booth selling this wonderful Hawaiian turmeric tea. 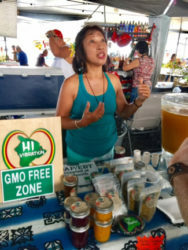 She grows all the ingredients on her farm and is so passionate about her organic drink. As we were talking to her, other customers came up and were chatting to her about how great they felt after drinking her tea (it almost seemed like a commercial – one after the other, people were coming by to talk to her about the great tea and were back for more). I had to try some for myself (iced) and it was delicious! I added a bit of agave to mine to add a bit of sweetness. We bonded and later went to visit her homestead farm in Orchidland (how cool is that she lives in an area called “Orchidland”?!) where she knows every plant and its benefits by heart. Acai. Noni. Carrots. Turmeric, Ginger. 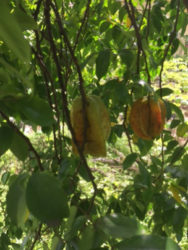 Mango. 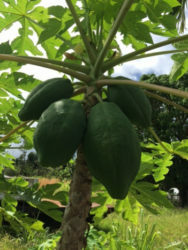 Papaya. 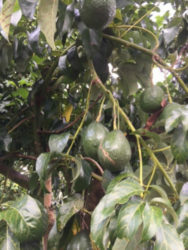 Japanese eggplant. Basil. Water Spinach. I could go on and on! The pictures here are from her farm. When I told her that I wanted to purchase a few batches of her Aloha Sunshine Tea to bring back to the shop, her first response that she needed a few days first because she had to harvest more turmeric and process it (dry and grind). WOW! It doesn’t get any fresher than that! I love finding small batch, passionate entrepreneurs and sharing their products with all of you. 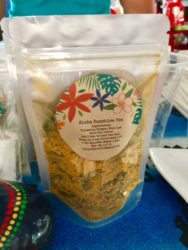 So, whether you just want a healthy drink that is good for your body, or are looking to specifically try something natural, come pick up the Aloha Sunshine Tea. Each package makes 16 cups of tea, or 1 gallon. She says that many of her clients make it up as iced tea and keep it in the fridge to sip on throughout the week. Others keep it on hand and make a cup, hot or cold, for a boost when feel a cold coming on. Or maybe you have a friend that is going through some health issues and you want to reach out with something good for them…this would be perfect. Ginger: Calms the stomach, a digestive marvel, helps prevent nausea and vomiting, as well as motion sickness. Noni leaves: Indian Mulberry, Known to the Polynesian people as “the sacred plant.” Regulates blood sugar, improves the immune system, helps fight cancer by stimulating white blood cells, contains anti-oxidant. Sour Sop leaves: Lower blood pressure, boost the immune system, soothe inflammation, prevent the spread and development of cancer, maintains cholesterol level, aid weight loss.